The administration has followed through by holding a hearing on its proposal to repeal the Clean Power Plan – former President Barack Obama’s signature plan to curb climate-warming emissions in the electric sector. The administration has also taken steps to revisit rules that would limit emissions from new fossil fuel plants, light-, medium-, and heavy-duty-) vehicles, and methane sources like new oil and natural gas equipment. At the same time, the administration has also moved forward with rules to support baseload coal generation and orders to increase oil and gas production on public and tribal lands. If the administration continues with these plans, it could significantly compromise the United States’ ability to deliver on its Paris Agreement pledge (known as a nationally determined contribution, or NDC) to reduce emissions by 26 to 28 percent from 2005 levels by 2025. Much of the trajectory for U.S. emissions depends on how quickly policies are reversed or revised, and what will replace them. In addition, many states, cities and companies have stepped up in response to Trump’s announcement on the Paris Agreement with their own statements of “We Are Still In,” pledging to support the agreement and to take action on climate change. A recent report from America’s Pledge has documented the scope and scale of non-federal action, showing that more than 2,500 non-federal actors, representing more than half of the U.S. economy, have pledged support for the Paris Agreement goals. The report was released by Gov. Jerry Brown of California and UN Special Envoy on Climate and Cities Mike Bloomberg, with analysis by our colleagues at WRI, the Rocky Mountain Institute and CDP. The U.S. emissions trajectory of the next several years will depend in part on what impact these subnational and corporate actions will have and how much market forces will continue to drive decarbonization. At the global level, it is also too early to tell whether other countries will step up and make up for the lack of U.S. climate action. In the wake of these changes to federal climate policies, we have sought to explore two questions: (1) How might policy rollbacks increase emissions? and (2) To what extent might action by states, cities, and others counteract such an increase? We reviewed recent studies from seven organizations to review and synthesize their assumptions and findings to date. The America’s Pledge initiative will also dig deeper into these issues in the months ahead by aggregating and quantifying the full range of potential U.S. non-federal action and what that means for future U.S. emissions. On the first question, we looked at seven studies by Climate Action Tracker, Climate Advisers, Climate Interactive, National Center for Climate Change Strategy and International Cooperation (NCSC), Resources for the Future, and Rhodium Group. These studies examine different scenarios of Trump administration impacts on US greenhouse gas (GHG) emissions in 2025, and estimate what emissions levels would have been under Obama’s policies. Besides U.S. emissions, Climate Interactive examines global emissions and global temperature under Trump administration policies. On the second question, we reviewed studies by the Carbon Brief and the Sierra Club, which evaluate the potential of states and other actors to offset Trump’s policies. Taken together, the first seven studies suggest that if Trump’s policies are put into effect, U.S. emissions in 2025 will range from 5.6 to 6.8 Gt carbon dioxide equivalent (CO2e). Under Obama’s policies, estimates suggest emissions would have ranged from about 5.0 to 6.6 GtCO2e. 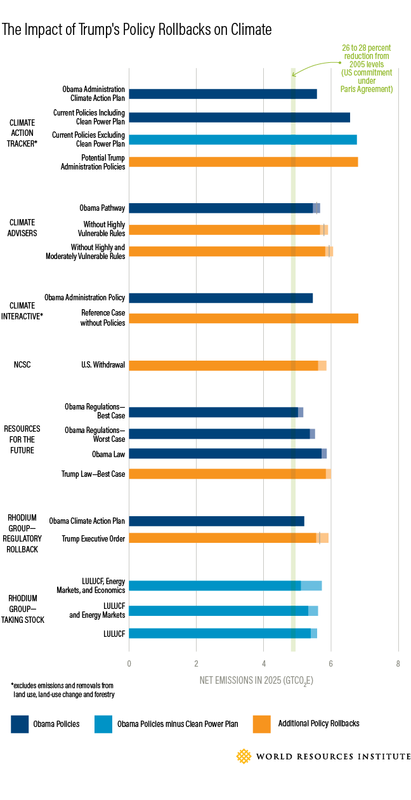 Scenarios that consider Obama’s policies without the Clean Power Plan find a range of 5.1 to 6.8 GtCO2e. (Excluding the studies that do not consider land use, land-use change, and forestry, those ranges are 5.7 GtCO2e to 6.0 GtCO2e under Trump, 5.0 GtCO2e to 5.9 GtCO2e under Obama, and 5.1 GtCO2e to 5.7 GtCO2e under Obama without the Clean Power Plan.) All these scenarios show emissions in 2025 higher than the U.S. target of 4.8 to 4.9 GtCO2e. Most are also higher than 2015 emissions of 5.8 GtCO2e, which reflects that additional actions would have been necessary between now and 2025 to achieve the U.S. NDC even if the full suite of Obama’s policies had been enacted. Unsurprisingly, the studies find that the United States would have come closer to hitting its NDC target under Obama’s policies than under Trump administration proposals. Climate Interactive also assesses what global emissions would rise to if the U.S. does not make any efforts to meet its NDC and finds that emissions in 2025 would be 57.3 GtCO2e, in contrast to 55.8 had the NDC been achieved. The same study finds that the US NDC alone would have resulted in 0.3 degrees C (0.5 degrees F) less warming (3.3 degrees C (5.9 degrees F) versus 3.6 degrees C (6.5 degrees F)) without it, not accounting for Paris Agreement mechanisms to ramp up ambition over time – a significant contribution towards the Paris goal of limiting warming to 1.5 to 2 degrees C (2.7 to 3.6 degrees F). ✔ indicates the policy is included in the scenario; X indicates the policy is excluded. Methane policies include performance standards and venting and flaring rules for oil and gas, as well as landfill regulations. HFC policies include refrigerant regulations, SNAP rule, or other actions to meet the targets under the Kigali Amendments to the Montreal Protocol. *Scenario excludes oil and gas regulations but includes landfill regulations. Only some of the analyses explicitly consider the extent to which market forces will influence US emissions. Resources for the Future uses the Biennial Report (BR), updated to reflect the 2017 GHG inventory, as its basis for projections, with no consideration of reductions resulting from market forces beyond those captured in the biennial report and updated inventory. The Rhodium Group’s Trump’s Regulatory Rollback Begins analysis held macroeconomic and energy price assumptions constant and aligned them with EIA’s 2017 Annual Energy Outlook forecast. The Rhodium Group’s Taking Stock report includes an examination of uncertainties based on the interactive effects of multiple market forces and quantifies the impacts of a variety of related assumptions. Groups differed in how they estimated land sector removals and specifically how significant a carbon sink the U.S. would have in the future. For example, the Rhodium Group’s Trump’s Regulatory Rollback Begins analysis considers a range of projections for land sector sequestration. In contrast, Climate Interactive’s analysis excluded land sector emissions altogether. Can States, Companies and Market Forces Counteract the Trump Effect? As already noted, Trump’s decision to withdraw from the Paris Agreement has been met by a loud backlash among states, cities, businesses and others. Over 2,500 governors, mayors and others have joined the We Are Still In campaign. While future America’s Pledge analysis will examine how these actions can affect future emissions, we reviewed two existing studies that explored how states and other sub-national actors can close the emissions gap left by Trump administration rollbacks to achieve the U.S. Paris Agreement target. First, a Sierra Club analysis quantifies the potential for three categories of action to achieve the US target: accelerated replacement of coal with clean energy resources like wind and solar; defense of existing policies including the Mercury and Air Toxics Standard, vehicle standards and HCFC rules; and local action by businesses and local elected officials to embrace clean energy and transition away from fossil fuels. Collectively, Sierra Club’s research finds that if these actions are achieved they could reduce emissions by almost 4.5 GtCO2e in 2025. Second, an analysis by Carbon Brief identifies the share of US carbon dioxide emissions from states that are members of the U.S. Climate Alliance, other states that have GHG emission reduction targets and states that lack such controls on GHG emissions. It explores the levers states can use to control emissions from electricity, transport and on-site sources. The Carbon Brief concludes that if states find the political will to use these levers, they could meet the U.S. climate commitment. The Trump administration’s actions to reverse actions to reduce GHG emissions isolates the United States and will likely slow this country’s progress on tackling climate change and advancing clean energy. How much emissions and global temperatures will rise as a result has yet to be fully determined, and will depend in large measure how subnational action in the United States, such as the We Are Still In campaign, market forces and international efforts can sustain momentum in the coming years. The recommitment to the Paris Agreement by world leaders other than Trump at the G20 summit, and progress at COP23, shows their intent to demonstrate the opportunities offered in working toward a low-carbon future. Many U.S. cities, states, regions and companies are already joining other countries in taking the helm on climate and clean energy action and pointing the way toward a low-carbon future.